Oliver Hazard Perry was born in Rhode Island, August 23, 1785. The late Commodore Mackenzie, of the navy, who possessed what we may term a fine biographical faculty, has traced in his interesting narrative of the Life of Perry, with fond minuteness, the early incidents of the boy's career. The chief characteristics, he tells us, "were an uncommon share of beauty, a sweetness and gentleness of disposition which corroborated the expression of his countenance, and a perfect disregard of danger, amounting to apparent unconsciousness." This biographer gives some curious anecdotes of his school days. Suffice it to say, that the family removing to Newport about this time, Perry found good opportunities of education at that place, and availed himself of them in a manly spirit. He was especially instructed in mathematics, and their application to navigation and nautical astronomy. As proof of the boy's ingenuousness, and the interest he excited in intelligent observers, it is related that Count Rochambeau, the son of the General of the Revolution, then residing at Newport, was particularly attracted to him, and that Bishop Seabury, on his visitation, marked him as a boy of religious feeling. These are traits which shape the man; we shall find them reappearing in the maturity of Perry's life, in his worth, humanity, and refinement. The boy was but thirteen when his father, in 1798, was called into the naval service of his country in the spirited effort made by President Adams to resist the aggressions of France upon the ocean. He took the command of a small frigate, built under his direction in Rhode Island, named the General Greene, and carried with him to sea his son Oliver as a midshipman, at the express solicitation of the youth. The General Greene was actively employed in the waters of the Gulf of Mexico, giving all its officers abundant opportunity for practice in the infant service. The French war flurry after a while blew over, as the Directory, the mainspring of these aggressions, lost power; peace was patched up, and Jefferson shortly after inaugurated an unwholesome pacific policy by a sweeping reduction of the navy, as if it were not small enough already. In this mutilating operation the elder Perry was dropped, the younger one fortunately retained. The navy, however, was soon revived by the demands of the nation to resist the iniquitous and insulting depredations upon life and property inflicted by the Barbary powers. The United States had borne far too patiently with these injuries, though she had the honor of being in advance of the old powers of Europe in resisting them. The Mediterranean became the scene of many a chivalrous exploit of our early officers, a score of whom, headed by Preble, Bainbridge, Decatur, Somers, and others of that stamp of fiery and indomitable valor, gained immortal laurels by their deeds of daring in conflict with the infidel. 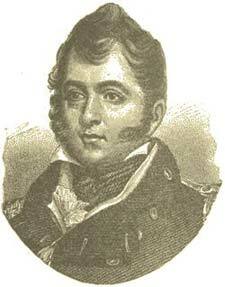 The young Perry served as midshipman in the frigate Adams, which sailed from Newport, in 1802, to join Commodore Morris' command at Gibraltar. His ship was for some time employed in blockading a Tripolitan at that port; a tedious but instructive service in manoeuvring, at the close of which Perry, in consequence of his accomplishments, was promoted by his captain to the duties of a lieutenant. The frigate was then employed as a convoy, making the tour of the northern ports. This gave Perry an opportunity to study scenes of the old world, which can never lose their influence in the formation of the man of education and refinement. In 1809, Perry got to sea in command of an armed schooner, the Revenge, which was employed on the coast service. While on the southern coast, he had an opportunity to gain distinction, which he did not fail to avail himself of, in cutting out a stolen American vessel from under the guns of a British ship in Spanish waters, off Florida. Conveying his prize off the coast, he was threatened by his Majesty's ship Gore, of double his force, when, having, as Mackenzie says, "no idea of being 'Leopardized,'" he put his little schooner in readiness for boarding at a moment's notice--a spirited resolution of great bravery, which he would no doubt have carried out, had the British vessel insisted upon overhauling the Revenge. While engaged in cruising off Connecticut and Rhode Island, in the beginning of 1811, he unfortunately lost his vessel, through an error of the pilot, on the Watch Hill Reef, opposite Fisher's Island, as he was sailing from Newport to New London. Every seamanlike effort was made to save the vessel, and when all was unavailing, Perry showed equal skill and resolution in landing the crew in a heavy January swell, with a violent wind. He was himself the last to leave the vessel. He was not merely acquitted of neglect, but his conduct was extolled by a court of inquiry. He was, of course, thrown temporarily out of command by the loss of his vessel; an interval of repose which he hastened to turn to account by forming a matrimonial alliance with Miss Elizabeth Champlin Mason, of an influential family at Newport, to whom he had become engaged several years before, on his arrival from the Mediterranean. The wedding took place in May, 1811, affording him ample opportunity for the honeymoon, previous to the actual outbreak of the war impending with England. This event found him at Newport, with the rank of master commandant, in charge of the flotilla of gunboats keeping watch in the harbor. It was a service not altogether adapted to satisfy the ambitious spirit of a young officer, but it was important in itself, and became, in Perry's hands, a step to future eminence. His course, at this time, illustrates a valuable truth, that no honorable employment is profitless to a man of genius. He will in some way turn it to account. Constructing gunboats, and recruiting men in port, were services not calculated to make any great blaze in a despatch, but they conducted Perry to his glorious bulletins of victory, and the resounding praises of the nation. He saw the new field of military operations opening on the lakes, and his experienced eye must have seen as well the certain difficulties, as the possible honors of the situation. It was not the post which an officer with the claims of Perry would have sought, while brilliant victories were being won, in the eye of the world, on the vast theatre of the ocean. Others, however, were before him on that element. Despairing of a command at sea, he offered himself to Commodore Chauncey, who had recently been placed at the head of the lake service. His character was understood by this officer, and the proffer accepted. The necessary communications were made to the Government, and in the middle of February, in 1813, he was ordered to join Chauncey at Sackett's Harbor, with the picked men of his Newport flotilla. He lost no time in reporting himself at the appointed spot. His destination was Lake Erie, where he was to supervise the construction of two vessels to be employed in the next campaign, and he was anxious to get to the work; but Chauncey, who felt the need of his aid, detained him for a while on Lake Ontario. He, however, toward the end of March, reached Erie, where the vessels were building. His experience in constructing gunboats at Newport was now of avail to him. He put the defence of the works, which had been greatly neglected, in a state of efficiency, and set himself to the collection of supplies, workmen, and an armament: no easy matter at that day and in that place in the wilderness; for such, as compared with our own time, it then was. The labors of Perry in this work of preparation were, in fact, of the most arduous character. They should not be forgotten as a heavy item to his credit in the sum total of his victory. Three gunboats and two brigs were launched and equipped in May. It was at this time that he received advices that Chauncey was about to make an attack on the British post of Fort George, at the mouth of the Niagara River. He had been promised a share in this adventure, and hastened to the scene. The incidents of this journey show the spirit of the man. In his own words, in a letter describing this passage of his life: "On the evening of May 23d, I received information, about sunset, that Commodore Chauncey would in a day or two arrive at Niagara, when an attack would be made on Fort George. He had previously promised me the command of the seamen and marines that might land from the fleet. Without hesitation I determined to join him. I left Erie about dark in a small four-oared open boat. The night was squally and very dark. After encountering headwinds and many difficulties, I arrived at Buffalo on the evening of the 24th, refreshed, and remained there until daylight; I then passed the whole of the British lines in my boat, within musket-shot. Passing Strawberry Island, several people on our side of the river hailed and beckoned me on shore. On landing they pointed out about forty men on the end of Grand Island, who, doubtless, were placed there to intercept boats. In a few moments I should have been in their hands. I then proceeded with more caution. As we arrived at Schlosser, it rained violently. No horse could be procured. I determined to push forward on foot; walked about two miles and a half, when the rain fell in such torrents I was obliged to take shelter in a house at hand. The sailors whom I had left with the boat, hearing of public horses on the commons, determined to catch one for me. They found an old passing one which could not run away, and brought him in, rigged a rope from the boat into a bridle, and borrowed a saddle without either stirrup, girth, or crupper. Thus accoutred they pursued me, and found me at the house where I had stopped. The rain ceasing, I mounted; my legs hung down the sides of the horse, and I was obliged to steady the saddle by holding by the mane. In this style I entered the camp, it raining again most violently. Colonel Porter being the first to discover me, insisted upon my taking his horse, as I had some distance to ride to the other end of the camp, off which the Madison lay." Having thus reached head-quarters, arrangements were rapidly made, and the landing of the troops assigned to Perry. In the ignorance or inexperience of some of the officers, there was considerable confusion in directing the boats in the river, which was remedied by Perry's vigilance and decision. He was everywhere, in the midst of danger, guiding and directing; the unexpected attack of the British was met by his energy, the landing effected, and the object of the expedition accomplished. This victory opened the port of Black Rock, where several American vessels were collected, which Perry undertook to get into Lake Erie against the strong current of the river, a feat which was accomplished with extraordinary fatigue; so that he returned to his station at Erie, with a respectable addition of five vessels to his own newly launched little fleet in that harbor. The American force was composed of the brigs Lawrence and Niagara, of twenty guns each, and seven smaller vessels, numbering in all fifty-four guns. Captain Barclay, commander of the British forces on the lake, had the Detroit, of nineteen guns, the Queen Charlotte, Lady Provost, and three other vessels, numbering altogether sixty-three guns. The range of the enemy's guns gave them the advantage at a distance, when the corresponding American fire was ineffectual. The Americans, too, were under a disadvantage in the enfeebled state of the crews, by the general illness which prevailed among them. The British force had undoubtedly the superiority in trained men, as compared with Perry's extemporized miscellaneous command, and untried junior officers. The latter proved, however, to be of the right material. On the morning of the engagement the American fleet was among the islands off Malden at Put in Bay, when the British fleet bore up. There was some difficulty at first in clearing the islands, and the nature of the wind seemed likely to throw Perry upon the defensive, when a southeast breeze springing up, enabled him to bear down upon the enemy. This was at ten o'clock of a fine autumnal morning. Perry arranged his vessels in line, taking the lead in his flag-ship, the Lawrence, on which he now raised the signal for action, a blue flag, inscribed in large white letters, with the words of the dying Lawrence, "Don't give up the ship!" He accompanied this movement with an appeal to his men. "My brave lads, this flag contains the last words of Captain Lawrence. Shall I hoist it?" "Ay, ay, sir!" was the willing response. In this way he cheered the men in the awful pause, "a dead silence of an hour and a half," preceding the action, for in the light breeze the vessels were long in overcoming the intermediate distance of several miles. Perry, who knew the perils of the day, prepared his papers as if for death. He leaded the public documents in readiness to be cast overboard, and--a touching trait of these moments--gave a hurried perusal to his wife's letters, and tore them to pieces lest they should be read by the enemy. The awful silence is suddenly broken by a bugle sounded on board the Detroit, and the cheers of the British seamen. A shot from that vessel fell short of its mark. The Lawrence bears on to meet the fire, accompanied by the other vessels of the command in appointed order, each destined for its appropriate antagonist. At noon the British fire from the superior long guns, was telling fearfully on the American force, when Perry made all sail for close quarters, bringing the Lawrence within reach of the Detroit. He maintained a steady, well-directed fire from his carronades, assisted by the Scorpion and Ariel. The destruction on the deck of the Lawrence was fearful. Out of 100 well men, says Mackenzie, who had gone into action, 22 were killed and 61 wounded. We shall not insult the humanity of the reader by the details of this fearful carnage. It has probably never been exceeded in the terrors of the "dying deck," in naval warfare. In the midst of this storm of conflict, Perry, finding his ship getting disabled, and seeing the Niagara uninjured at a safe distance, resolved to change his flag to that vessel. He had half a mile to traverse, exposed to the fire of the enemy, in an open boat. Nothing deterred, with the exclamation, "If a victory is to be gained I'll gain it," he made the passage, part of the time standing as a target for the hostile guns. Fifteen minutes were passed exposed to this plunging fire, which splintered the oars and covered the boat with spray. The Lawrence, stripped of her officers and men, was compelled to surrender. Perry instantly bore up to the Detroit, the guns of which were plied resolutely, when she became entangled with her consort, the Queen Charlotte, and the Niagara poured a deadly fire into both vessels. This cannonade decided the battle in seven minutes, when the enemy surrendered. The American loss in this engagement was 27 killed and 96 wounded; that of the British 41 killed and 94 wounded. Gallant actions were performed and noble men fell on both sides. It was every way a splendid victor, placing the genius of Perry and his magnanimous, spirited conduct throughout, in the highest rank of naval exertion. The memorable letters, brief, at once eloquent and modest, which he wrote that afternoon announcing his victory, are too characteristic to be omitted in any personal account of the man. Addressing General Harrison, he writes: "Dear General--We have met the enemy and they are ours. Two ships, two brigs, one schooner, and one sloop. Yours, with very great respect and esteem. O. H. Perry." The other was to the Secretary of the Navy: "Sir, it has pleased the Almighty to give to the arms of the United States a signal victory over their enemies on this lake. The British squadron, consisting of two ships, two brigs, one schooner, and one sloop, have this moment surrendered to the force under my command, after a sharp conflict. I have the honor to be, sir, very respectfully, your obedient servant. O. H. Perry." In consonance with this simple eloquence, the mark of a master-mind, was his chivalrous care of his wounded and conduct toward his prisoners. The victory having been gained, and the lake thus cleared of the foe, Perry was enabled to act in concert with General Harrison in driving the British from Michigan, and when his fleet was of no avail to follow them in their rapid flight, he joined that officer's land expedition, and was present, acting as his aid, at the battle of the Thames. "The appearance of the brave commodore," writes Harrison in his official report, "cheered and animated every heart." Perry also gained the gratitude of the Moravians, in whose district the contest took place, by his care in relieving the inevitable evils of war. He met everywhere on his homeward route with complimentary toasts and resolutions, gathering volume as he reached his native State, where he was received at Newport with military and civic honors. The city of New York paid him a grateful attention in a request communicated by De Witt Clinton, then mayor, to sit for his portrait for the civic gallery. The portrait was painted by Jarvis, representing him in the act of boarding the Niagara, and is preserved in the City Hall. He was created an honorary member of the Cincinnati; Congress voted him a medal and money; he was dined and feasted, and "blazed the comet of the season." Perry's next service was in August, 1814, in command of the Java, 44, a frigate recently built at Baltimore. He was, however, not able to get to sea, in consequence of the blockade by the enemy. On the conclusion of peace he sailed in this vessel to join Commodore Shaw's squadron in the Mediterranean. In 1819 he sailed as commodore in command of the John Adams, for the West Indies, bound for the State of Venezuela, to carry on an armed negotiation for the protection of American commerce from aggressions in that quarter. Arriving at the mouth of the Orinoco, he shifted his flag to the Nonsuch, and ascended the river to the capital, Angostura, where he remained twenty days transacting his business, in the height of the yellow-fever season. His vessel had hardly left the river, on her way to Trinidad, when he was attacked. For nearly a week he suffered the progress of the terrible disease on board the small schooner, under a tropical sun, when he reached the station whither he had sent his flag-ship, the Adams. But he reached port only to die at sea, within a mile of the anchorage, on August 23, 1819, when he had just completed his thirty-fourth year. Such and so early was the fate of the gallant Perry. His remains were interred from the John Adams at Port Spain, with every attention by the English governor. Subsequently they were brought home in a national vessel by order of Congress, and reinterred at the public expense in the cemetery at Newport. The country also provided for the support of his family. If ever America produced a man whom the nation delighted to honor it was Perry.